Downtime just became more fashionable and fun. This eye-catching set makes the perfect upgrade to your loungewear collection. The festive prints are exciting and the socks are cozy. Be sure to grab two sets — one for you and the other for a gift! Top Fit: Close-Fitted: Designed with no more than 2" of ease between body and garment. Measures 2" larger (at most) than the fit-critical body measurement. Follows your curves, outlining your figure. Pant Fit: Fitted: Designed for 2 to 3 inches of ease between body and garment. Measures 2" - 3" larger than the fit-critical body measurement. Slightly more relaxed than a close fit, still outlines figure but not tightly. 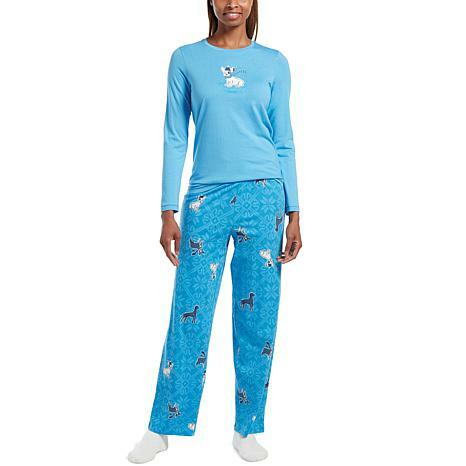 Love, love these Pj's I would recommend them for teens and MOM's. Good quality with comfortable wear. Bought for my grown daughter as a gift and I see she can't get out of them! Really good quality and nice fitting.